A leader with no clue where real wealth comes from. From the founding of this country, our leaders have clearly understood the essential importance of private enterprise, and most of our leaders have participated in it themselves. George Washington, Thomas Jefferson, and John Adams, in addition to their legendary political careers, were "gentleman farmers" who operated what were, for the day, fairly large businesses complete with employees, payrolls, sales, accounts receivable, and accounts payable. How, then, is it that we have reached a point where we have a President who has not only never run a private enterprise or even been employed by one since college... but where virtually his entire cabinet has the same total lack of experience with the whole source of America's wealth and success? 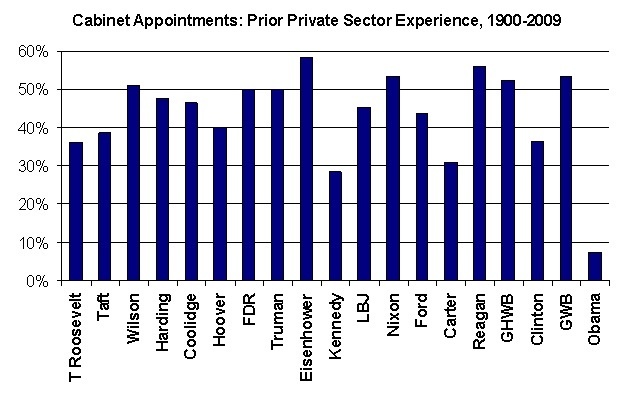 Consider this graph of private-sector experience by cabinet members throughout the past hundred years, and fear. Mr. Obama's appointees appear to have one-fourth the business experience of President Carter's, and the Carter administration was not exactly a time of stellar economic growth. Revolutionary America held entrepreneurship as such a strong ideal that it was more expected than exceptional. Of course, some people lived their entire lives as employees of others - farmhands, able seamen, and the like. For the most part, however, the ultimate objective of time spent in service to another was to one day strike out on one's own. 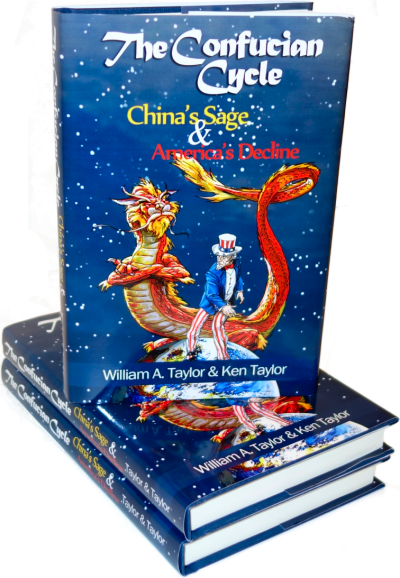 Until the 1840s, there really were no enterprises that could not be financed and run by one individual, or at most several wealthy men working jointly - sponsoring a merchant sea voyage or whaling expedition, building a mill, and so on. Every man was his own capitalist, to the extent that he could accumulate any capital or property, as any diligent worker could hope to do. With the invention of the railroad came the first industrial venture that, by its nature, required more resources than any group of friends could provide. Thus was invented the joint-stock corporation where many individuals pooled their capital to create vaster enterprises than had ever been seen before. The machinery of the Industrial Revolution worked a change in the relationship between workers, management, and owner. An apprentice could hope one day to be an independent master craftsman with his own apprentices; a farmhand could, if he wished, strike out for the West and establish his own homestead. Few factory workers could expect to own their own factory someday, or would have any idea how to run one if they had it. We find ourselves in today's world where the vast majority of ordinary people perform work for wages paid by a company that they themselves could not hope to ever run. And yet, for all that American business is replete with mammoth corporations whose wealth and power exceeds that of many entire countries, still the vast majority of Americans work for small businesses of a more human size. Every economic recovery in America has been led, not by the General Motors and General Electrics of the world, but by Ma's Pie Shop and Pa's Pizza Parlor. There's a reason for this: By the very nature of business inertia, small businesses are going to far more nimble, responsive, and efficient than large ones. They have to be! A small business cannot long survive if it has too many employees, wastes money on unneeded fripperies, or doesn't give the customers what they want. In contrast, gigantic corporations can survive for years on the accumulated fat from the success of previous generations. General Motors has been continually falling farther and farther behind the competition since the 1970s, yet only now did they finally reach bankruptcy - only to be propped back up by the government. Will they ever die? Or will they continue to stumble on forever as a zombie, too big to kill and too big to succeed? How many airlines have followed the same path, or banks, or railroads? Nobody bails out the little shop on the corner if it can't make it on its own. The harsh crucible of small-business competition refines, hones, and teaches American entrepreneurs, creating the next generation of business geniuses. What is more, by definition, businesses contribute wealth to the American economy. If customers didn't view their wares as worth paying for... they simply don't, and the business dies. Big businesses may contribute less, but they still contribute something, except where government subsidies distort the market. In stark contrast, most modern government employment makes a negative contribution. What does a bureaucrat contribute to the economy? He takes from the economy the amount of his salary, which must be robbed from the productive sector via taxes... and then, by creating red tape which jams the gears of commerce, he destroys additional wealth. For every new-hired bureaucrat, the nation as a whole gets poorer. Even during the Great Depression, this quickly became obvious. Franklin Roosevelt was presented with a staggeringly high unemployment rate. The obvious solution, espoused by the famous economist John Maynard Keynes, was simply for the government to hire everyone who wanted to work. Keynes even argued that it made no difference exactly what these workers did, their salaries would jump-start the economy. "To dig holes in the ground," paid for out of savings, will increase, not only employment, but the real national dividend of useful goods and services. Roosevelt wasn't such a fool as to actually pay people to dig holes and fill them back in again, of course; much of the work of the Civilian Conservation Corps was quite useful infrastructure and is with us to this day, particularly in national parks. For all that, though, it didn't solve the problem. Why? Because government jobs do not create a working economy. If they did, the Soviet Union would have worked, because everyone worked for the government and there was technically no unemployment whatsoever. Yet anyone alive in 1989 should know that Communism led to an impoverished land of collapsing infrastructure, massive environmental pollution, and negligible material comforts; even the powerful apparatchiks atop the pile led lives little better than the ordinary American middle class. More than 90 percent of the jobs created by this plan will be in the private sector. Although President Obama initially said that 90 percent of the jobs created by the stimulus program would be in the private sector, the data suggests that well over half of the jobs claimed so far have been in the public sector. The Obama administration is following the same failed path of Roosevelt, the Soviet Union, and the sclerotic states of Europe. Government is absolutely necessary - the last thing we need is anarchy - but, by itself, government cannot create wealth, growth, or progress. The very best that government can do is to create an environment where private enterprise, harnessing the hopes, dreams and imagination of millions of private individuals, can bring us these things. Alas, our government wants to weigh down companies and individuals with heavy taxes - "cap-and-trade" carbon emissions taxes, raising the limits for Social Security withholding, and worst of all, the uncertain tax consequences of "health care reform." Make the cost of employment higher... and you'll get less of it, sure enough. It's clear that, for Obama, the "business" and true calling of America is government. He and his cabinet have neither experience nor clue about anything else. Even at his "Jobs Summit," Obama invited unions, economists, professors, government analysts, big corporation representatives, and other assorted leeches, but nobody to represent the small businesses who have always done the actual hiring. Our Founders would be far past the Tea Party stage by now; they'd be on the march with pitchforks, tar, and feathers, defending their private farms and shops from onerous and oppressive statist greed. No second opinion that small and medium sized businesses and entrepreneurships are the real players who can contribute and lead towards economic recovery in America. Equally ,more jobs in public sector means more buyers for the goods being produced by SAMSB&E. No hurting meant ,during the present 'Great Depression' the Civilian Conservation Corps should develop the infrastructure destroyed by the World's ONLY SUPER INTOXICATED POWER in Iraq and Afganistan for hunting only two persons- Saddam & Osama(Really?.Frankly writing, these two wars are the real root cause of all this Economic Debacle.